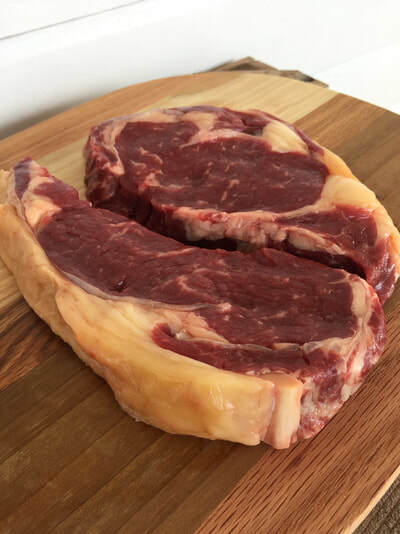 Custom or Bulk Beef is a great way to buy affordable grass fed beef and the added bonus is that it is always in your freezer! Also known as buying a whole cow, half cow, and cow pooling. It can seem overwhelming at first, but it's actually really easy. 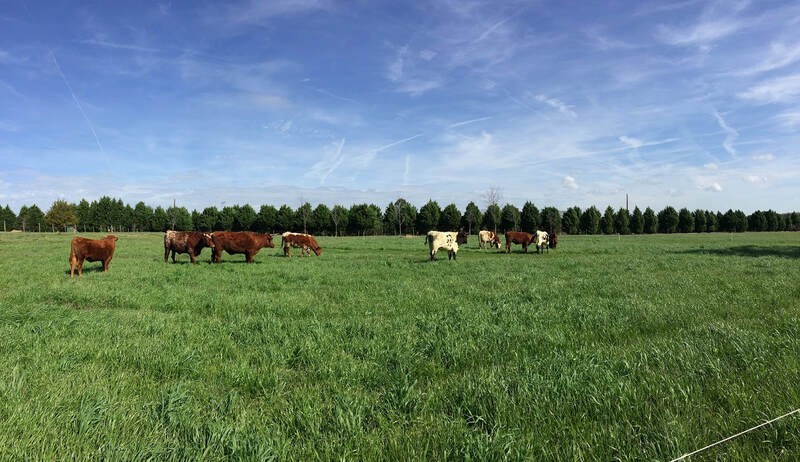 Custom Availability: We harvest animals in the early winter and late spring and summer, depending on the weather and pasture quality. FAQ's and how does custom cow processing work? How much beef should I buy? Many families share a whole beef between 2 or 3 families, but we also have families who buy 1 whole beef from us each year. What is "Hanging weight"? This is the weight of the animal after the harvest process which removes the head, internal organs, hooves, hide. The butcher call us and tells us the hanging weight and then we send the information to you. After it dry ages about 14 days, the butcher processes the carcass into the different cuts and some more weight will be lost from moisture loss, trimmings and de-boning. You can expect a "take home" weight in packaged meat of about 60% of the hanging weight, depending on how much of the animal you choose to put to use (bones, organs, etc). 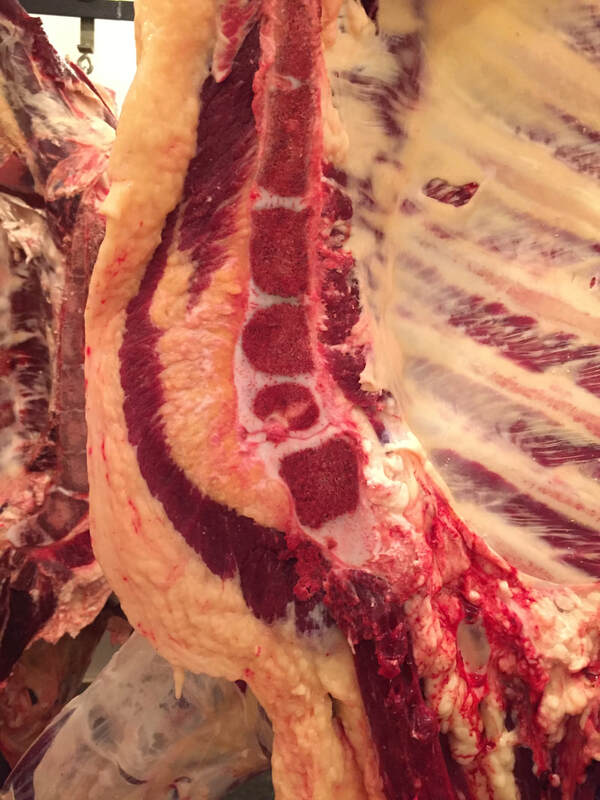 ​​What is Dry aging? Your beef will hang in the processor's coolers at about 34F for 14 days. During this time, moisture is lost and flavor concentrates as the beef becomes more tender. 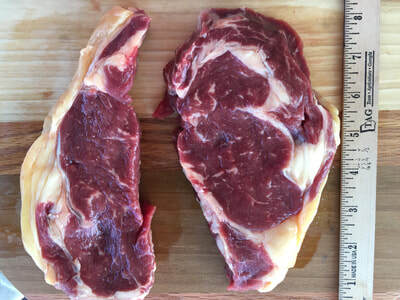 Is cooking grass fed beef difficult? Not at all! But be sure you are familiar with Grass Fed Beef's cooking differences from Grain Fed. Due to the lack of high fat content in grass fed beef, it's less forgiving on the grill than grain fed. The biggest challenge is not overcooking it. Get a digital meat thermometer. Do it. Steaks: Cast iron pan! High hot heat -really sear it- for 2-3 min each side, then low low heat (away from any direct flame or coal) until it comes to 5 degrees below the temp you want for rareness/done-ness. Then remove and let rest, it will climb the extra 5 degrees, and the juices will settle. Ground beef: is always delicious on the grill and easy. Roasts: slow cooker or slow and low in the oven. This is a great Youtube Video about buying bulk beef experience. How many pounds of beef will I get? A whole animal (packaged, take home) weight is about 250-350lb depending on the animal, a half is about 130-175lb, and a quarter 60lb-85lb. We will estimate as close as possible at the beginning, but please remember that the final weights will vary and we can't give you an exact number until the butcher calls us with that information. What cuts do I get? How do I specify my cuts? You will submit a "cut sheet" to us with your instructions for processing. Which cuts you get depends on how it's cut and how many of each depends on what you order, split half, half, or whole. An average whole breaks down to about 30% ground beef, 20% stew and stir fry, 20% steaks, and 20% roasts, and 10% misc like brisket, liver, oxtail, etc. When can I expect to pick up my beef? It can take some time for custom beef to be available, depending on the time of year and how much your order. For example, if you order a split half that's only 1/4 of an animal. We have to wait until we get other customers to purchase the other 3/4 of the animal before we can send it off. It usually takes about 6-8 weeks from the time you order. However, if you need beef sooner, we often have split halves available in our freezers. Just give us a call! Once your beef has gone to the processor, we will keep you informed on a timeline so you don't have any surprises. Do you deliver? We do! Delivery to a dropoff location in Athens is free, delivery to the Atlanta area is $50. Deliveries may be delayed until we have a full truck but we do everything we can do get your beef to you as soon as possible. Ok so this is a lot of beef...what is my end cost? Is it really cheaper? You will always come out cheaper buying bulk beef than buying retail packages. On average your beef will cost $6.50/lb-$8.00/lb for everything from ground beef to Tenderloin steak! That's a GREAT deal since retail beef costs $8/lb for just ground beef and upwards of $22/lb for steaks! DO NOT arrive at different times if you are sharing a whole cow. The processor has a full schedule. Make sure everyone arrives at the same time or has someone come for them. COOLERS: When picking up at the butcher, expect to need 30 quarts cooler space per 25lbs (or 1 cu ft). If your order is 85lbs, for example, you'll need 103 quarts of cooler space. ALWAYS bring an extra cooler, even if it's just a soft sided cooler, since some of the cuts are bulky and can take up room. We recommend at least one large cooler around 100 quarts since some of the cuts are too big (like the brisket) to fit in a 30qt cooler. Usually you can bribe a friend to borrow one if you don't have one! You don't need to put ice in the coolers. Just don't stop at a yard sale on the way home! BLANKETS INSTEAD OF COOLERS: We have some customers who are comfortable using thick blankets to wrap their boxed beef in instead of putting it in coolers. If you don't have far to go, and it's not July, this may be a great option!